Is it so good that it will resurrect the Dead? It’s pure natural medicine. I have experienced what I believe to be the most nourishing and mineral-rich food that my wife and I can eat? – it’s not Just soup – it is bone broth – I started eating Bone Broth and have never looked back – We found it worked for many of our ailments. I researched it and found that what I thought was a secret, is not. Many people around the world for centuries have made it. It is so nutritious there is hardly a disease or ailment that it does not help healing. Here is a round-up of amazing information. Bone broth contains glucosamine and chondroitin to help osteoporosis, joint pain, arthritis (one of my challenges) and assists with bone formation, growth and repair. Bone Broth Boosts Immunity – my personal health focus – Amino acids in bone broth, like arginine, glutamine, and cysteine, will boost immunity in humans and your pet. Bone Broth Improves Hydration – especially when it’s made and mixed with vegetables, adds electrolytes (minerals) and carbohydrates (from vegetables) to the diet. Studies have shown that drinking broth can rehydrate better than water alone due to the electrolytes. Bone broth will heal the lining of the digestive system – It is what you need to repair a leaky gut. It will restore the gut with beneficial flora and relieve the body of an excess toxic load. The calcium in bone broth is a beautiful and bioavailable supplement for children and their growing bones, women seeking to prepare their bones for menopause and everyone in between and beyond and is a perfect first food for a baby transitioning from breast milk to other foods. One of the most healing nutrients found in a traditionally home-prepared bone broth is collagen. Collagen is the most abundant protein found in the human body that holds your tissues, muscles, and joints together. It’s made up of amino acids, including glycine, proline, and hydroxyproline, which can also help promote a healthy gut. The gelatine in bone broth, is perhaps the essential aspect, protects and heals the mucosal lining of the digestive tract and helps aid in the digestion of nutrients. It can improve the skin, hair, and nail growth. It reduces inflammation of the joints, tones up the body and skin, improves digestion, boosts muscle growth, strengthens blood vessels and intracellular networks, optimises the metabolism, detoxifies the body, strengthens the bones and stimulates the immune system. It even helps to regulate weight, eliminate sleep disorders, and speed up the healing of wounds. The collagen and gelatine in bone broth support hair growth and helps to keep your nails strong. My wife cannot believe the improvement in her nails. The calcium, magnesium and phosphorus in bone broth help our bones to grow, repair and fight inflammation. Bone broth is a Candida cleanse, promotes sleep, helps with weight loss, restores exercise capacity and calms the mind. Build Muscle with Bone Broth – the amino acids in bone broth can help stimulate muscle protein synthesis. Muscle protein synthesis is essential for the ongoing growth, repair, and maintenance of skeletal muscle groups. 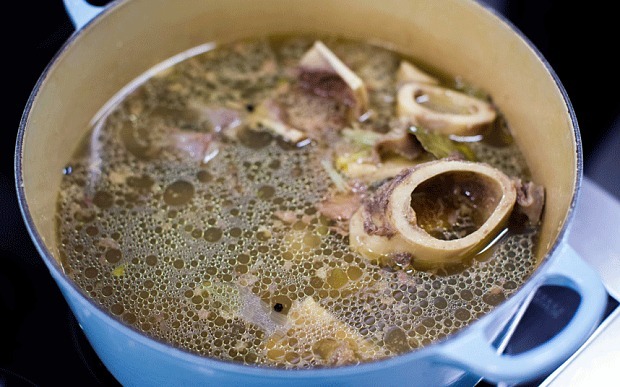 Improve Mood with Bone Broth. Your diet influences your gut bacteria, and your gut bacteria influences your brain. According to neuroscientists, your gut bacteria are continually speaking to your brain. The makeup of gut bacteria, called your microbiome, influences how the brain is wired from infancy to adulthood, along with moods, memory, the ability to learn, and how to deal with stress. When the gut microbiome is healthy, it sends happy signals to the brain; when it’s unhealthy, it can send messages of anxiety. Because of this signalling, neuroscientists are starting to investigate how to manage gut bacteria to treat mood and stress-related disorders such as depression. Biologists say that the degenerative and inflammatory diseases on the rise in industrialised societies could be corrected by the use of gelatine-rich foods due to the presence of restorative amino acids such as glycine, alanine, proline, and hydroxyproline. In addition to these benefits of bone broth, the gelatine it contains has additional bonus side-effects. Helps regulate bleeding from nosebleeds, heavy menstruation, ulcers, haemorrhoids, and bladder haemorrhage. Helps normalise stomach acid, which is useful for colitis, celiac disease, ulcers, and other inflammatory gut conditions. Bone broth is full of proline and glycine, which are two amino acids needed for DNA and RNA synthesis and proper digestive health. These amino acids are also essential for wound healing, detoxification in the liver, and regulating blood sugar. If you want to raise yourself out of the grave of ill-health, consume a minimum of one cup of broth per day. I also take a nutritional powerhouse consisting of 13 plant extracts, 13 other organic elements, and glycans comprising of superior forms of mannose harvested from Aloe – It is called ARUCA.